ToolMaker provides a new approach to customising your RISC OS desktop with replacement toolsprites. 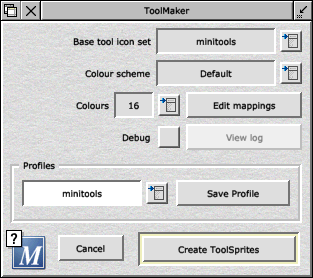 Unlike traditional theme managers, which simply swap in different sets of icon sprites, ToolMaker maintains a database of tool sprite definitions, created in a Logo-like script language. Once you've defined all the sprites for a particular set of toolsprites, you can change the colours to your hearts content. ToolMaker will automatically create an entire set of ToolSprites from the sprite definitions and the colour scheme you require. The benefit of ToolMaker is that it keeps the icon definitions separate to the icon colours, so if you have a set of icons you like, you don't have to spend ages editing every icon in !Paint, in order to change the colour scheme. The main window, showing some of the current options. Actual layout and design may change by the time it's officially released. It's very much a 'work in progress' at the moment. A useful theme manager for RISC OS. A 'work in progress' tool for generating sets of tool icons. RISCOS.org's desktop themes resources page. This page aims to be a definitive source of desktop themes and replacement icons. a) Bug fix: Correctly read colours when importing 16 colour sprites. b) Allowed sprites to be dragged to iconbar as well as main window in order to import. c) Bug fix: Correctly convert transparent/masked pixels when importing sprite data. d) Further optimised sprite import routine to add lines for repeated similar colours. manually reload colours if you've edited the colour translation table). translation icons if using more than 16 colours. f) Bug fix: Correct conversion error in colour translations. g) Added additional set of tool sprite definitions, based on Dacha's design. a) First release version, proof of concept only!